Even though you might not need a jacket Wednesday morning, you most certainly will by Wednesday afternoon. The calendar may read Spring, but thermometers will scream Winter by the end of Wednesday. The arrival of New Jersey's colder air mass is running a bit behind schedule so far. As of this writing, the cold front has passed through the entire state. And, as wind picks up Wednesday morning, temperatures will fall sharply through the afternoon and evening hours. The key to Wednesday's cooldown is a brisk northwesterly wind, gusting as high as 40 mph around midday. 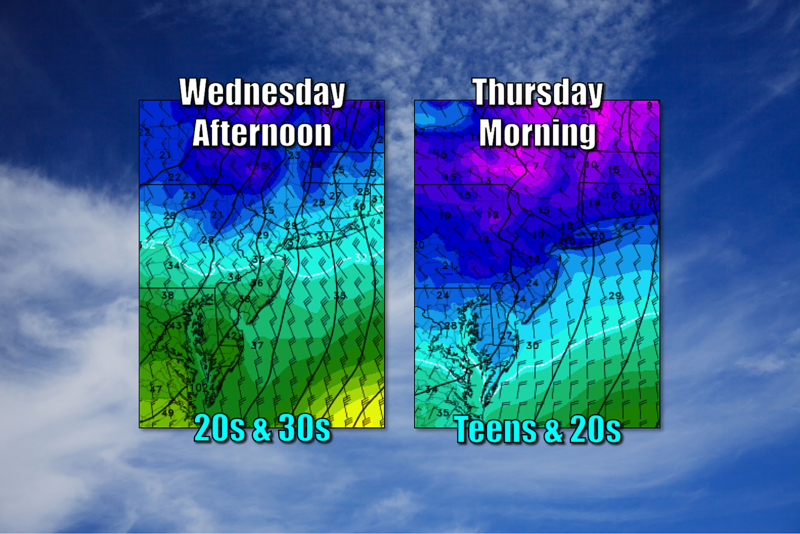 That will cause temperatures to tumble into the lower to mid 30s (at the warmest) through Wednesday afternoon. This would be a cold and blustery day, even in the middle of winter. But here we are in late March, where temperatures will plummet to about 15 degrees below normal. A Wind Advisory has been issued until 8 p.m. for NE NJ — Bergen, Essex, Hudson, Passaic, and Union counties. Skies will remain clear and our weather will remain dry on Wednesday and Thursday. Thermometers get even lower Wednesday night, bottoming out near 20 degrees by Thursday morning. While winds won't be as gusty, any little breeze will be biting. As the wind continues to lighten on Thursday, high temperatures will recover to the lower 40s. Still below normal, but better. A warm front on Friday will enact a return to mild temps, with highs forecast to reach the upper 40s to lower 50s. We'll also see an increase in cloud cover, ranging between partly and mostly cloudy. And there could be a few showers around on Friday too. The timing of those showers will dictate the precipitation type - if they happen early enough, there could be some wintry mix concerns in North Jersey. For now, even though models are still all over the place regarding timing, I'm leaning toward a "light and liquid" shower forecast. Saturday will be the warmest day of the week. Thermometers will climb well into the 60s across New Jersey, despite mostly cloudy skies. We could see a few raindrops along the way too. And then, things take a turn toward cooler and unsettled weather for early next week. (Overall, I'm not impressed nor convinced by the model output for early next week. So I have to leave details vague for now.) Rain will become likely on Sunday, potentially becoming even steadier on Monday. An on-shore flow (easterly winds) will keep skies cloudy and temperatures cooler — 40s on Sunday, with some 50s on Monday.